If you're trying organic for the first time then may I direct you to The Organic Pharmacy? With fans including Kylie Minogue and Donna Air, this is modern organic beauty at its best (and f.y.i the Carrot Butter Cleanser is to die for). The clean white packaging is far from worthy and is instead sleek and luxurious with well thought out details such as the inclusion of spatulas for hygenic and convenient dispensing from tubs. 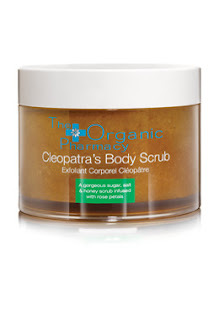 I've been testing Cleopatra's Body Scrub which is made with 75% organically produced ingredients. With a blend of both sugar and salt granules, it's an effective scrub yet it feels gentle on the skin. The thick scrub even has rose petals suspended within it and it's these, along with Ylang Ylang and Rose Geranium which lend it a gorgeous, grown-up fragrance without being overbearing. Following use, my skin felt wonderfully nourished and pampered which I'm putting down to the inclusion of honey and olive oil in the scrub. At £37.95, Cleopatra's Body Scrub has a pricetag fit for a queen however, I do feel that this is a quality product and you receive a generous 400ml for your money. Highly recommended.